California Law Bans Teachers from Shooting Back at Gunmen-Truth! & Fiction! - Truth or Fiction? California Law Bans Teachers from Shooting Back at School Shooters-Truth! & Fiction! Following the February 2018 shooting at Marjory Stoneman Douglas High School in Parkland, Florida, rumors surfaced that California Governor Jerry Brown banned teachers from shooting back at school shooters. California Governor Jerry Brown signed a law in October 2017 that strips the authority of school administrators to allow teachers to store and access guns on school campuses. 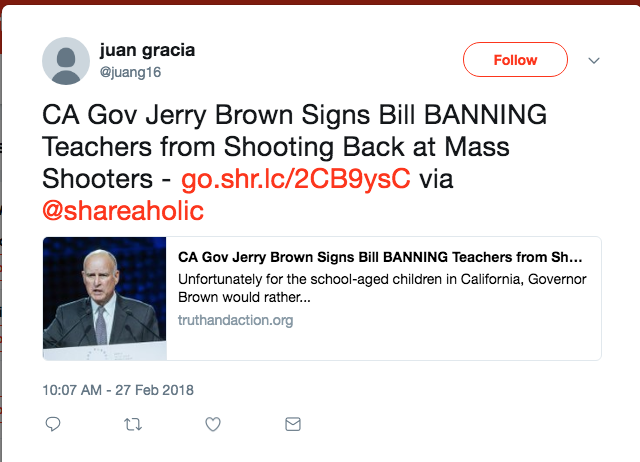 But the California governor didn’t specifically “ban teachers from shooting back” after the mass shooting at Marjory Stoneman Douglas High School. Senate Bill 707, which was enacted in October 2015, strengthened the state’s 1995 gun-fun school zone laws. The original law made it illegal to possess a weapon within 1,000 feet of a school campus, but there was an exemptions for those with concealed weapons permits. Senate Bill 707 extended the prohibition to concealed weapons, but it exempted those with permission from school administrators. Then, in October 2017, California Governor Jerry Brown signed Assembly Bill 424 into law. That law stripped administrators of the ability of grant exemptions for those with concealed carry permits. Unfortunately for the school-aged children in California, Governor Brown would rather see them dead than allow adults to have the right to take out a mass shooter. This is no joke. In response to the recent shooting at Marjory Stoneman Douglas High School in South Florida, Assemblyman Kevin McCarty (D-Sacramento) introduced bill AB 424. We’re calling this one “mostly truth.” It’s true that California’s gun-free school law ensures that teachers can’t shoot back if attacked because they can’t have guns under state law. But the law wasn’t passed because the Stoneman Douglas tragedy. California Governor Jerry Brown signed a law prohibiting all guns on school campuses — but that was well before the school shooting in Parkland, Florida. Barack Obama Trying to Become United Nations Secretary-General-Fiction!